Explosive Testosterone Boosting! Cortisol Modulation & Mood Elevation! Since the dawn of the human race it is has been postulated that humankind is constantly evolving. In fact the father of evolution, Charles Darwin, proposed the idea that only the fittest among us survive. Unfortunately the process of evolution is a slow one and we do not want to miss precious “gains” time. You may already be behind due to genetics and it can be discouraging when you work hard but do not see the growth you desire. No longer will be stuck in the middle of the pack because Olympus Labs can provide you an opportunity to forge a new destiny. 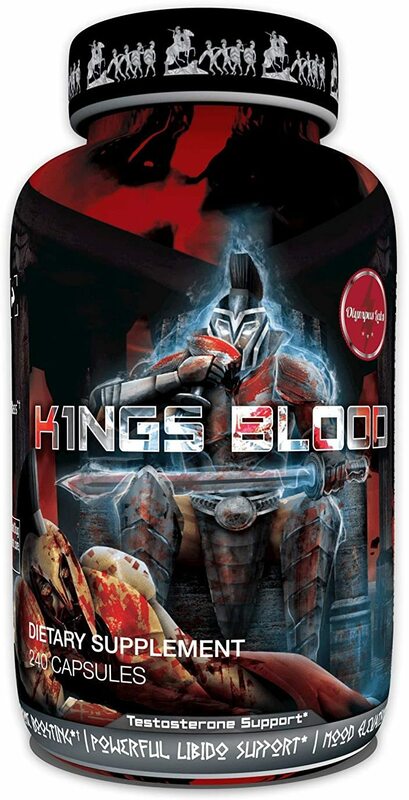 Ascend to the ranks of the aristocracy with KING’S BLOOD. No matter what you route you choose the Olympus Labs commitment of Innovation, Value Results will be thrust into action. KING’S BLOOD contains a total of 11 ingredients at complete doses. Olympus Labs takes the guesswork out of supplementation, there are no fillers, no ingredients taking up space, only compounds befitting of a King. Are you ready to defy your genetics? Are you ready to defy the laws of evolution? Are you ready to forge a new destiny and ascend the ranks of the aristocracy? It can be reality with KING’S BLOOD! Why: The ultimate tool to optimize key hormone levels, enhance performance and boost Virility. Who: Primarily designed for males. Females may benefit from using the product at half dose, for above mentioned effects.